Pinpoint the best place to watch. Shield your eyes. Procure protective viewing glasses—and steer clear of fakes. Expect traffic jams and large crowds. Prepare for the weather. Such tips are plentiful as states, cities, and stargazers prepare for the Aug. 21 total solar eclipse. But there’s another aspect of the historic eclipse that is discussed less often: the tax responsibilities. As about a dozen states prepare for their moment of darkness, some have taken steps to ensure individuals coming to see the spectacle or sell their wares know whether they should be paying or collecting tax. Ensuring individuals know their tax responsibility ahead of the event gives state revenue departments a better chance at success, Liz Malm, a senior policy analyst and economist at MultiState Associates, told Bloomberg BNA. The Idaho State Tax Commission, for example, has posted a one-page brochure detailing when individuals must collect taxes the day of the eclipse. A 6 percent state sales tax applies to selling T-shirts. A 2 percent travel and convention tax, the state sales tax, and local sales taxes apply to renting out a yard for overnight camping. 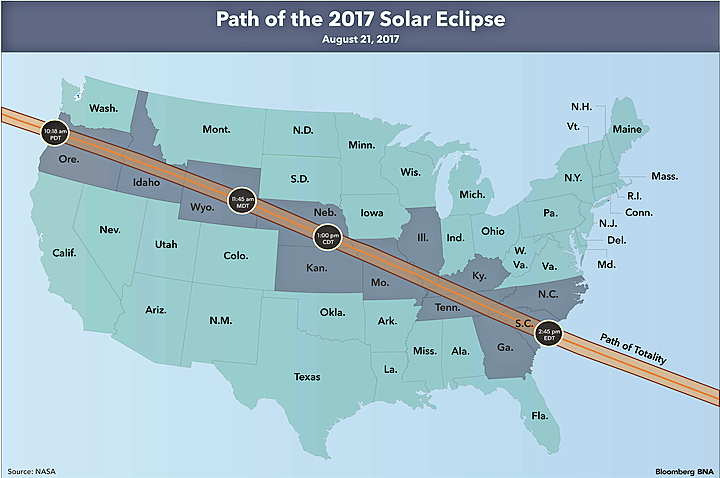 The eclipse will be fully visible in Carbondale, Ill., which is also in the path for another display in April 2024. Any vendors at the city’s “Eclipse Marketplace"—which features live music, food trucks, and art booths—must factor in Illiniois’ 9.75 percent for any sales made before, during, or after the eclipse, according to the state’s Department of Revenue. A Special Event Tax Collection Report and Payment Coupon is posted online for vendors to report and pay within 10 days. Because the eclipse will pass over states for varying lengths of time—from just over one minute to about three minutes—and because state requirements vary widely, it’s hard to set a single expectation, said Scott Peterson, vice president of U.S. tax policy and government relations for Avalara, Inc., which specializes in sales tax collection. And it will be a challenge to get individuals to consider federal and state tax authorities in the excitement of the eclipse, specialists told Bloomberg BNA. Most won’t think about it at all. The eclipse could be a boon for vacation rental owners looking to cash in on their location in its course. The vacation rental marketplace HomeAway, Inc. has seen 500 percent growth in bookings in several cities in the eclipse’s path, compared to the same date in 2016. Properties in some areas are renting for as much as $2,000 per night, notable for “a seemingly random Monday in the middle of August,” Adam Annen, a public relations manager, told Bloomberg BNA in an email. Homeowners aren’t required to file income taxes on rental property if they rent for fewer than 14 days, he said. That is in line with the so-called “Master’s exemption” for all short-term vacation home rentals, named after the golf tournament hosted in Augusta, Ga. Still, individuals should do their homework ahead of time because they may face state taxes, Caroline Bruckner, a professor and managing director of the Kogod Tax Policy Center at American University’s Kogod School of Business, told Bloomberg BNA. “It’s not that people are always trying to game the system. In many cases it’s just they don’t even know,” she said. Airbnb Inc. didn’t return a request for comment on the impact of the eclipse or how it’s preparing renters. Owners of short-term accommodations are responsible for sales tax collection in 25 states, whereas 15 states impose this collection obligation on third-party companies that facilitate the reservations. Airbnb collects taxes on behalf of hosts in some states in the eclipse’s trajectory like South Carolina, Oregon and Wyoming, according to the company’s website. South Dakota isn’t in the path of the eclipse, but its Department of Revenue is used to juggling tax administration duties every year for the Sturgis Motorcycle Rally, a 10-day event drawing half a million riders. Staffers also created an iPad application so revenue agents can track licenses at the event and send information quickly to the main office, Wade LaRoche, public affairs manager with the South Dakota Department of Revenue, told Bloomberg BNA. Ensuring hundreds of vendors are properly licensed is no easy task, so the technology, which they began developing in 2015, has been critical, he said. “Special events like the Sturgis rally, they pose challenges to our staff and it can be frustrating to the vendors as well. They change location through the event, they’re spread out,” he said.